The Coyne case (or “Army helicopter incident”) stands out as, perhaps the most credible (in the “high strangeness” category) of the 1973 wave. An Army Reserve helicopter crew of four men encountered a gray, metallic-looking, cigar-shaped object, with unusual lights and maneuvers, as they were airborne between Columbus and Cleveland , Ohio. 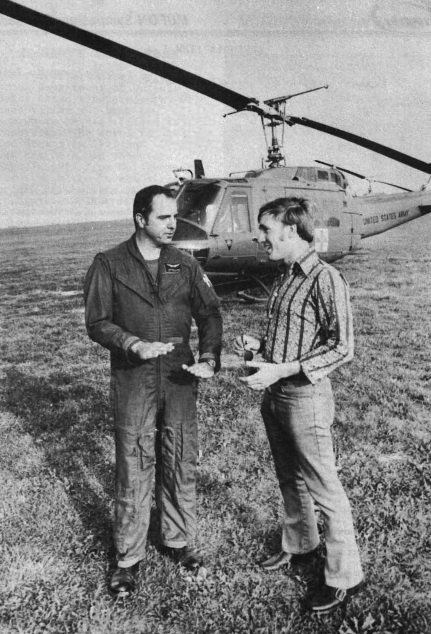 On October 18, 1973, at approximately 10:30 PM a UH-1H helicopter of the United States Army Reserve left Port Columbus, Ohio, for its home base of Cleveland Hopkins airport, ninety-six nautical miles to the north-northeast. In command, in the right-front seat, was Captain Lawrence J. Coyne, thirty-six, with nineteen years of flying experience. At the controls, in the left-front seat, sat First Lieutenant Arrigo Jezzi, twenty-six, a chemical engineer. Behind Jezzi sat Sergeant John Healey, thirty-five, a Cleveland policeman who was the flight medic, and Coyne was the Crew Chief, Sergeant Robert Yanacsek, twenty-three, a computer technician. The helicopter was cruising at 2,500 feet above sea level at an indicated airspeed of ninety knots, above mixed hills, woods, and rolling farmland, averaging 1,200 feet elevation. The night was totally clear, calm, and starry. The last quarter moon was just rising. After an estimated additional thirty seconds, Yanacsek announced that the light had turned toward the helicopter and appeared to be on a converging flight path. Coyne verified Yanacsek’s assessment, grabbed the controls from Jezzi, and put the UH-1H into a powered descent of approximately 500 feet per minute. Almost simultaneously, Coyne established radio contact with Mansfield control tower, ten miles to the northwest. Coyne thought the flight was an Air National Guard F-100 from Mansfield. After an initial acknowledgment (“This is Mansfield Tower, go ahead Army 1-5-triple-4”), radio contact failed. Jezzi then attempted transmission on both UHF and VHF frequencies without success. Although the channel and keying tones were both heard, there was no response from Mansfield; and a subsequent check by Coyne revealed that Mansfield had no tape of even the initial transmission, the last F-100 had landed at 10:47 P.M. The red light continued its radial bearing and increased greatly in intensity. Coyne increased his rate of descent to 2,000 feet per minute and his airspeed to 100 knots. The last altitude he noted was 1,700 feet. Just as a collision appeared imminent, the unknown light halted in its westward course and assumed a hovering relationship above and in front of the helicopter. “It wasn’t cruising, it was stopped. For maybe ten to twelve seconds – just stopped,” Yanacsek reported. Coyne, Healey, and Yanacsek agree that a cigar-shaped, slightly domed object substended an angle of nearly the width of the front windshield. A featureless, gray, metallic-looking structure was precisely delineated against the background stars. Yanacsek reported “a suggestion of windows” along the top dome section. The red light emanated from the bow, a white light became visible at a slightly indented stern, and then, from aft/below, a green ‘pyramid shaped” beam equated to a directional spotlight became visible. The green beam passed upward over the helicopter nose, swung up through the windshield, continued upward and entered the tinted upper window panels. At that point (and not before), the cockpit was enveloped in green light. Jezzi reported only a bright white light, comparable to the leading light of a small aircraft, visible through the top “greenhouse’ panels of the windshield. After the estimated ten seconds of “hovering,” the object began to accelerate off to the west, now with only the white “tail” light visible. The white light maintained its intensity even as its distance appeared to increase, and finally (according to Coyne and Healey), it appeared to execute a decisive 45 degree turn to the right, head out toward Lake Erie, and then “snap out” over the horizon. Healey reported that he watched the object moving westward “for a couple of minutes.” Jezzi said it moved faster than the 250-knot limit for aircraft below 10,000 feet, but not as fast as the 600-knot approach speed reported by the others. There was no noise from the object or turbulence during the encounter, except for one “bump” as the object moved away to the west. After the object had broken off its hovering relationship, Jezzi and Coyne noted that the magnetic compass disk was rotating approximately four times per minute and that the altimeter read approximately 3,500 feet; a 1,000 foot-per-minute climb was in progress. Coyne insists that the collective was still bottomed from his evasive descent. Since the collective could not be lowered further, he had no alternative but to lift it, whatever the results, and after a few seconds of gingerly maneuvering controls (during which the helicopter reached nearly 3,800 feet), positive control was achieved. By that time the white light had already moved into the Mansfield area. Coyne had been subliminally aware of the climb; the others not at all, yet they had all been acutely aware of the g-forces of the dive. The helicopter was brought back to the flight plan altitude of 2,500 feet, radio contact was achieved with Canton/Akron, and the flight proceeded uneventfully to Cleveland. Mrs. E. C. and four adolescents were driving south from Mansfield to their rural home on October 18, 1973, at approximately 11 P.M., when they were attracted to a single steady bright red light. flying south “at medium altitude.” They watched for perhaps half a minute until it disappeared to the south over the trees. Approximately five minutes later, now driving east on Route 430, approaching the Charles Mill Reservoir, the family became aware of two bright lights – red and green – descending rapidly toward them from the southeast. When first seen, the angular distance between the lights was about 2 degrees; the red light appeared to be leading. Mrs. C. pulled over to the shoulder of the deserted road and kept the engine and car lights running. The lights – bigger than point sources – slowed and moved as a unit to the right of the car and the family became aware of yet another group of lights – some of these flashing – and “a beating sound, a lot of racket” approaching from the southwest. Two of the children (cousins, both age thirteen) jumped from the car and observed both a helicopter and the object, which they described as “like a blimp,” “as big as a school bus,” “sort of pear shaped.” The object at that point subtended an angle equivalent to “a 100-mm cigarette box held at arm’s length.” The object assumed a hovering position over the helicopter, an estimated 500 feet back from the road and 500 feet above the trees. (The ground elevation at the site is almost exactly 1,000 feet above sea level; thus at the noted 1,700-foot altimeter reading, the helicopter was actually about 650 feet above the trees.) The object’s green light then flared up. “It was like rays coming down,” the witnesses said. The helicopter, the trees, the road, the car – everything turned green.” The kids scrambled with fright back into the car and Mrs. C. proceeded apace. 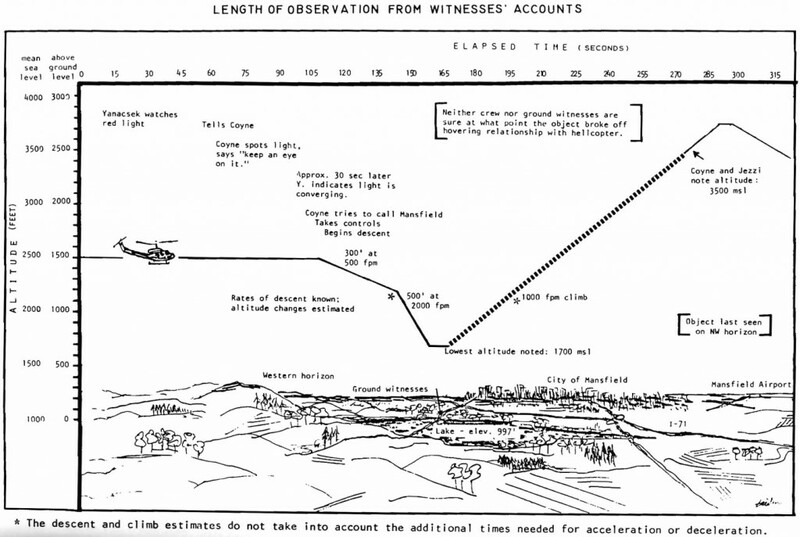 Their estimated total time outside the car was “about a minute.” Neither ground witnesses nor aircrew are sure at what point the two aircraft disengaged; the ground witnesses reported that the unidentified object crossed to the north side of the road behind the car, appeared to move eastward for a few seconds, then reversed its direction and climbed toward the northwest towards Mansfield – a flight path which correlates perfectly the motion of the object established through analysis of the aircrew’s report. Any theory of the object’s being a meteor (UFO skeptic Philip Klass maintains that the object was a “fireball of the Orionid meteor shower”) can readily be rejected on the basis of: (1) the duration of the event (an estimated 300 seconds); (2) the marked deceleration and hard-angle maneuver of the object at closest approach; (3) the precisely defined shape of the object; and (4) the horizon-to-horizon flight path. The possibility of a high-performance aircraft likewise is untenable when one examines the positions and colors of the lights with respect to the flight path of the object. To have presented the reported configurations, and been in accordance with FAA regulations, an aircraft would have had to be flying sideways, either standing on its tail, tail-to to the helicopter, or upside-down head-on. Other arguments against aircraft hypothesis are: (1) a fixed-wing aircraft moving across the line of sight would appear to move most rapidly when passing directly in front of the observer; (2) a fixed-wing aircraft would not have the capability of decelerating from high velocity to “hover” within a few seconds time; (3) a helicopter would have the capability of hovering, but would not be capable of the high forward speeds reported; (4) a conventional aircraft, if within 500 to 1,000 feet, would have produced noise audible inside the helicopter; (5) the FAA requires either a strobe or a rotating beacon on either the top or bottom of the fuselage, (6) FAA requires that no aircraft shall fly below 10,000 feet msl at speeds above 250 knots; (7) some of the features of a conventional aircraft would have been seen, e.g., wings, engine pods, windows, empennage, numbers, logo. Coyne reported that the Magnaflux/Zygio method of nondestructive testing was applied to the rotors the following day and that there was no indication that they had been subjected to fatigue-producing stresses. Comparable times/distances/directions support the possibility that the red light first seen by the C. family, Healey’s red light, and the object of the encounter were all one and the same. Yanacsek’s red light on the eastern horizon was under continuous observation and was unequivocally the object of the encounter. The case has maintained its high “strangeness-credibility” rating after extended investigation and analysis.